International Journal of Research in Health Sciences,2014,2,1,58-67. 1Assistant professor, 3 Professor & H.O.D, 4- Associate Professor, Department of Community Medicine, Rama Medical College Hospital and Research Centre, Ghaziabad (Uttar Pradesh), INDIA. 2Professor, Department of Community Medicine, Bharati Vidyapeeth, Deemed University Medical College, Pune, Maharashtra, INDIA. Aim: To find out the prevalence of refractive error in school children and common morbid conditions present amongst them. Material and Methods: It was a cross sectional study. 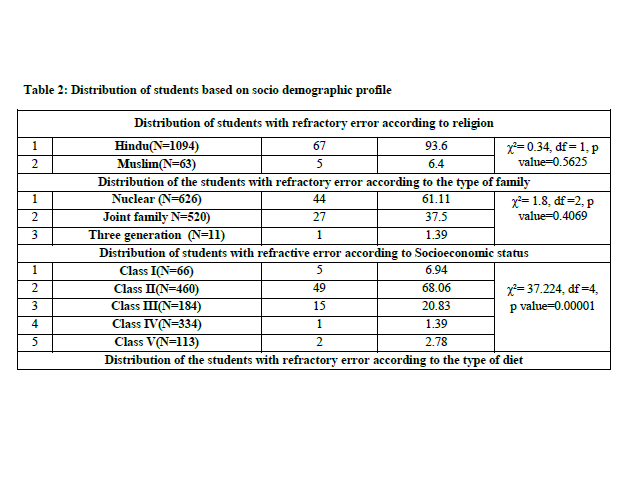 The present study was planned to know the prevalence of refractive in school children in Pune city, and their correlation with socio demographic profile if any. The study was conducted in urban field practice area of a Medical College in Pune. School children of age 6-16 years of selected urban schools in the field practice area were the study population. The sample size calculated was 866 but 1157 were covered in this study. Results: Prevalence of refractory error was 6.22%. Myopia was most common (94.44%) type of refractive errors. Most commonly occur in age group of belonged to 9-11 years, females (52.78%).Only 12(16.67%) were diagnosed early having refractive error other remained undiagnosed /undetected. Amongst them only 33.33% were wearing spectacles Most common reason for not wering spectacles was not made 25%, 52.78 % students had refractory error who have history of watching TV/or computer more than 3 hours. Conclusion: So to conclude present study highlights important problem of ocular morbidity in school children Refractory error. Refractory error was commonest form of ocular morbidity amongst them but most of it was undetected previously.